Well Husband was back at work this week. We missed having him home during the day. Especially on Tuesday because we had bad weather that kept us inside and missed our walk. It did clear up Tuesday afternoon enough for us to run to the grocery store. While I was looking at the zucchini, Little Girl decided that it sounded like a great idea to stick her finger through the plastic and pull out some ground beef. Needless to say, I was NOT happy about that. Taking her with me to the grocery store is becoming increasingly frustrating. She's constantly reaching into the buggy or the shelves to grab things. Correcting her behavior in public isn't exactly fun. Yet it must be done. My free time this week has been spent cleaning house. Saturday my family had our annual fishing trip at the lake. We never catch anything, but we always enjoy our time together outside. I may or may not participate in Armchair Book Expo this week. I haven't decided yet. Happy Memorial Day tomorrow to all of my US friends. Goodreads description--Emmett Atwater agrees to leave Earth behind when Babel Communications offers him a fortune. The catch? He has to launch into deep space to get it. One of ten selected recruits, Emmett boards the company's spaceship and sets course for a planet that Babel has kept hidden from the rest of the world. Before long, Emmett discovers that all of Babel's recruits have at least one thing in common: they're broken. Broken enough that Babel can remold them however it pleases. Every training session is a ruthless competition where friendships are tested and enemies are made. Each recruit must earn the right to travel down to the planet of Eden-- where they will mine nyxia, substance that has quietly become the most valuable material in the universe. But Babel's ship is full of secrets. Secrets about the volatile substance they're hoping to mine, about the reclusive humanoids already living on Eden, and about the true intentions for the recruits. Emmett will face the ultimate choice: win the fortune at any cost, or find a way to fight that won't forever compromise what it means to be human. "Brilliant concept meets stellar execution in this fast-paced deep space adventure. I was hooked from page one." This book sounds really good. I hope you enjoy it. I really don't care for sci-fi but this book sounds very interesting. Grocery shopping will get easier once your little one gets older, at least it did for me. Enjoy the crazy little moments because they grow up so fast. Have a wonderful week and enjoy your read. 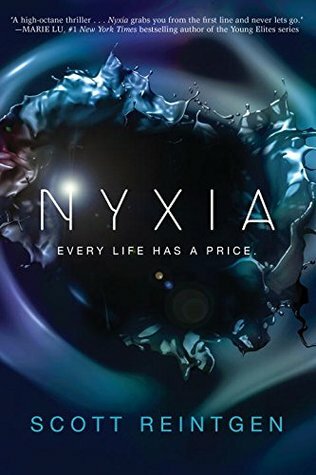 I've seen Nyxia around, based on the cover, but I've not taken a decent look at it. I hope you enjoy it! Oh yes...time is flying already. Thanks for stopping by Jovita! I've read like 2 pages of it...haha! I'm not much in a fantasy/sci-fi mood right now though. I hope I don't put it off too much longer though. Thanks for stopping by Greg! HAHA! Or the grocery cart! :) Thanks for commenting Laura! Oh yes! She's learning and taking it all in. I just have learned to be more proactive in giving her things to play with while we're in the store that I'm okay with her playing with. Unlike my ground beef! Thanks for commenting Sherry!